Burns can damage your skin and other body tissues as well. The condition can be caused by heat, exposure to chemicals, cold injuries, and electrical injuries. No matter what caused the injury, it is important that you receive first aid right away so that you can get rid of the pain and feel safe. 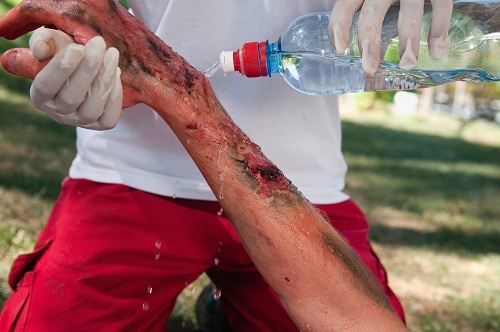 Treating burns with first aid is the best way to begin. All you need to know is the right first aid tricks, required to implement, right on the spot. Immediate treatment is effective and makes a significant change in recovery. Although there are plenty of ways to treat the condition, we’re here to discuss about the first aid tricks. · Start with rinsing the burned area with cold water. This will reduce the risk of complications. · Flush the area for at least 20 minutes. Make sure you’re not using hard spray of water. Put on gloves for safety and hygiene purpose. · Remove all jewelry or clothing which had contact with acid. · As a first aid provider, ensure the patient does not rub eyes as this may make the injury worse. · Use sterilized gauze to wrap the affected area. Keep it loose. This will protect the area from further contamination or injury. · Keep the patient warm on the way to hospital because burns cause the body to lose heat quickly. The best you can do is learn first aid and CPR from a reputed institute like Give First Aid in Sunshine Coast, Australia and get started with the classes. The institute has the best team of trainers and experts, who will be assisting you throughout your learning session.